The Xbox Live Marketplace has been hopping all week. So far there have been daily deals on games from the Resident Evil, Assassin's Creed, and Halo franchises. Today, the Call of Duty series is getting the discounted treatment. 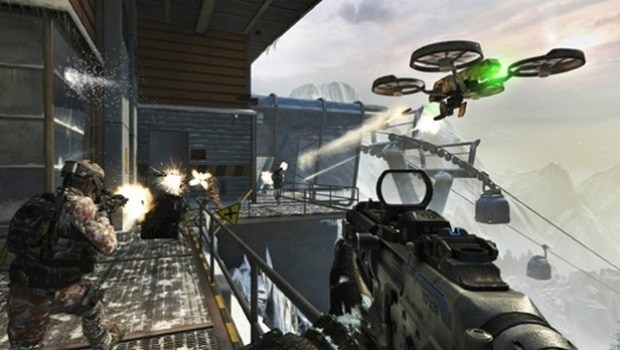 The military shooter juggernaut offers plenty of co-op, from the Zombie modes of the Treyarch developed Word at War, Black Ops, and Black Ops 2, to the Spec Ops modes of Infinity Ward's Modern Warfare 2 and 3. There are only a few hours left to this sale, so I'll skip poking fun at the most popular franchise in the world and get right to the savings. I "borrowed" this table from Major Nelson's blog. For your convenience, I have edited the game title links to take you to our cooperative coverage when available, so you can see what each game has to offer. I left the XBL Marketplace links intact on each game's pricing. Happy deathmatching! PlayStation 3 and PC gamers shouldn't feel left out. The Call of Duty: Black Ops 2 "Revolution" DLC is finally available on those platforms. This map pack features four new multiplayer maps, a new co-op zombie map, and a new zombie mode. Check out the launch trailer below. You can pick up "Revolution" DLC today for $14.99. Page created in 0.3429 seconds.